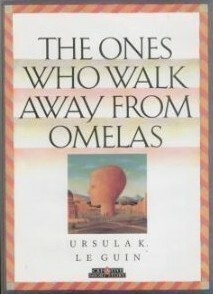 If you have not read Ursula Le Guin’s short story, “The Ones Who Walk Away from Omelas,” then take a moment to do so. The story describes a city that is perfect except for one thing. One child must suffer so that others can be happy. Furthermore, the people who live in Omelas are all shown the suffering child when they come of age, so no adult lives in Omelas without knowing how the system really works. This is, of course, an apt analogy for statism. Every state exists through taxation, which victimizes at least one person. All states in history have inflicted additional suffering on both those who live in their territory and those outside of it. So Omelas might be considered an ideal state — one with minimal suffering and maximum happiness. In the story, those who come of age in Omelas do one of two things. Most rationalize the abuse of the child and continue to live their comfortable lives. However, a few decide instead to leave Omelas. In the same way, those who support government are the majority in modern society. They want to live in Omelas and are willing to sacrifice others to do so. A few, however, realize that this is unethical and make the hard choice to reject statism regardless of the changes it might bring. This entry was posted in editorial and tagged anarchy, ethics, Libertarianism, minarchy, Omelas, Tho Ones Who Walk Away from Omelas, Ursula Le Guin, utopia on February 21, 2014 by rothbarddotcom.